Through out each month I'll be keeping a skin care diary and jotting down what I use on an every day basis. At the end of the month I'll tally up what has been used the most and share the products with you. 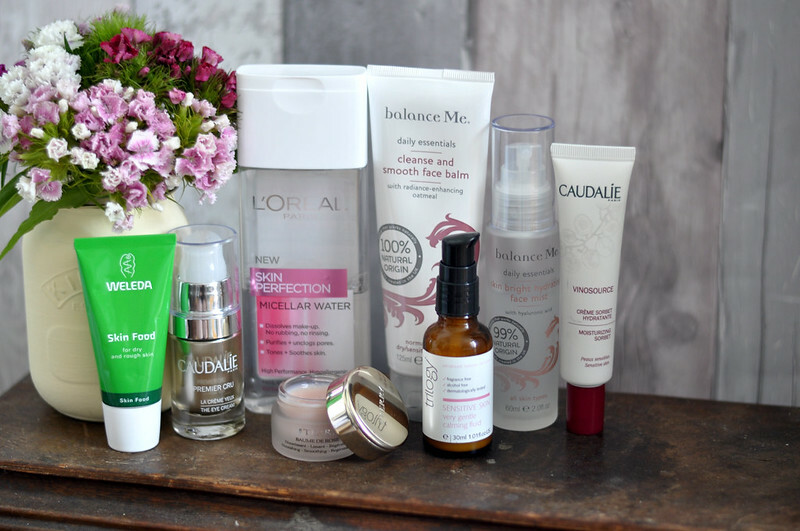 L'Oreal Micellar Water // balance Me Cleanse And Smooth Face Balm // balance Me Skin Bright Hydrating Mist // Caudalie Premier Cru The Eye Cream // Trilogy Calming Fluid // Caudalie SOS Moisturising Sorbet // Weleda Skin Food // By Terry Baume De Rose. This month my skin has been pretty constant and in a way normal. I've still had the odd spot, dry patches and sensitive skin but it hasn't been anything like other months where I've gone from one extreme to the other. Here's to hoping my skin carries on like this! I'm not sure if it's down to the products I've been using so I'm a bit scared to change things up. I'm only one or two uses away from finishing the balance Me cleanser so I will have no choice but to start using a different cleanser. I would just buy another tube but I'm trying to use up what I have first before buying anything new.